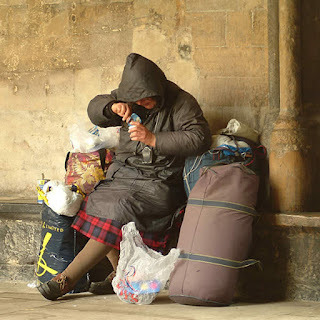 In Temple Gardens with the Thames close by she sits on a bench this homeless women, slumped forward, face pressed into a mound of belongings that she has stacked on her trolley with intricate care. Her face is pressed hard into the dirty clothing on top of her assortment of bags. Is she smothering herself? I stop and watch, but her breathing is deep and regular; the sleep of the constantly exhausted. And, along with the Temple Court barristers and office workers, I walk on by. She is a local character, part of the scene. The outreach teams working with the homeless will certainly know her. I might ask about her when I get back to the office, but I’ve convinced myself. And then, with a flush of guilt, I remember Peggy. For four years in the 1980s I was an outreach worker covering a patch stretching across most of central London from Kings Cross station down to Victoria at a time when the number of rough sleepers was vastly greater than today. Under the Queen Elizabeth Hall on London’s South Bank around 120 homeless men and women slept rough and there were many more scattered around Waterloo station. One of these was Peggy. Her features remain indelibly stamped in my memory. Grey hair held up in a bun, wisps escaping to frame her etiolated face, pale blue eyes, hunched shoulders, a gentle and genteel soul; everybody’s grandmother. Peggy had been around for a long time and there was an absurd urban myth surrounding her, oft-repeated by other rough sleepers, which was that she had come to Waterloo station to meet her lover returning from the war but he did not arrive having died in combat in the war’s final days. Heartbroken and with her mind unbalanced, she had continued to hover wraith-like around the station. Over a two-year period I talked with Peggy almost every night of my working week. The work was tough and frequently demoralising with the growing number of rough sleepers far outnumbering hostel vacancies. At the end of the evening we would walk up to Waterloo station to talk with Peggy who was invariably on the same platform where the Waterloo station staff kept a protective eye on her. Me: Peggy, how are you tonight? It really must be time for you to try a hostel. Aren’t you finding it cold? Wouldn’t you like a nice warm bed and a meal? Peggy: Thank you very much dear, that is very kind of you, but I am OK for tonight, I think. She would give a gentle smile, heave up her bags, and shuffle off along the platform and we would head back to the office at the end of another testing shift, comforted by the pleasant, light relief of the chat with Peggy, the final curtain on the night’s performance. We occasionally took colleagues from other teams out with us and in the latter part of 1986 we were pleased to be accompanied on our night-shift by Dennis, a Community Psychiatric Nurse. Dennis was a New Zealander, extremely experienced and rather shocked by the levels of rough sleeping he was witnessing in London. His considerable knowledge of mental and physical health issues was of great assistance to us that night. His careful, but direct, explanations to rough sleepers concerning what would happen if they did not get leg ulcers treated or rasping coughs properly investigated made an impact and we all resolved to follow up on the requests for further advice and support the next day. At the end of the night I invited him to accompany me onto Waterloo station to meet up with Peggy. I fear that I probably referred to her as ‘a bit of a character’. And there she was, pale, stooped, shaking her head from side to side gently and, as always, unfailingly polite to us. Back at the office, clutching a mug of tea, we discussed the night with Dennis and I found myself chuckling over Peggy and the unlikely story of her lover who hadn’t return from the war. Dennis was staring into his tea, frowning and clearly uncomfortable. Then suddenly he raised his head and asked bluntly, ‘Why are you letting her live like that?’ There was a tremor of anger in his voice and we were stilled. He proceeded, in unremitting detail to take us through what he had seen. In his view Peggy had some extremely serious health problems. For example, she was suffering from severe edema (water retention leading to swelling around the he legs) which could possibly be connected to a thyroid disease. She seemed to be experiencing auditory hallucinations or paracusia, probably brought on by extreme sleep deprivation. I remember that Dennis’ conclusion was that Peggy was probably ‘in torment’. We were chastened and embarrassed. This was not the ending that we had anticipated. I wish I could report that, within the week, we had encouraged Peggy to move away from Waterloo station but, alas, she remained obdurate, subsisting on the large sums of money given to her by generous members of the public, thrust into her hand without Peggy ever needing to openly beg. We dithered and prevaricated and it was around this time that I first heard the words, ‘lifestyle choice’. Talking to a mental health specialist about Peggy, one who had a different outlook to Dennis, they concluded that we had to accept that Peggy was making a lifestyle choice based on a largely rational consideration of her predicament and that foisting our own set of values on her was actually undermining her autonomy and individuality. At the time, I found this most reassuring. It was a welcome get-out. I could console myself that it was not down to me, it was up to her. As it happened, events conspired to save Peggy. Waterloo station had long been the haunt of homeless people but, by the end of the decade, this was coming to an end. No longer could the homeless sleep on the station, and that even included the iconic Peggy. So one evening we hired a car and Peggy, dishevelled and disorientated, was escorted from the station by kindly railway staff and, amidst emotional scenes, helped gently into the car and driven away to a temporary shelter. No longer would that end of the night ritual - the pre-departure conversation with Peggy - be played out. I only saw Peggy on one more occasion and it was a moment that left me pensive and subdued. Around a year after she had left Waterloo I was visiting a second-stage hostel for older men and women in south London to deliver into the safe keeping of the staff there a rough sleeper who had been promised a room. It was one of the best hostels in London with single rooms, supportive staff and the option of a permanent stay. As I was leaving I noticed a group of residents sitting on comfy chairs around a low table playing a board game, laughing and jesting in evident good spirits. Amongst the group and seemingly the centre of attention was a women unnervingly like Peggy, though she looked around ten years younger and was smartly dressed, with pinkish cheeks. I couldn’t leave without checking and turned back to the staff office to ask about this woman who I thought recognised, though knowing already the answer, which I was aware I was bracing myself to receive. It was indeed Peggy who, I was told, had slept rough for years but come on leaps and bounds since she’d moved into the hostel from a temporary shelter. I didn’t go over to say hallo to Peggy. I am sure she would have been impeccably polite, but I risked seeing a shadow cross her face as she connected me with the many grim years of getting by on Waterloo station and that was a risk I was not prepared to take. The lone rough sleeping women, often pejoratively referred to as a ‘bag lady’ remains an iconic figure standing out amongst her male counterparts, an eccentric curiosity, a feature of the local scene. Didn’t Alan Bennett even write a poignantly amusing play about one such homeless woman? They are a national treasure! I fear that this cloying sentimentality that bedevils our approach to women rough sleepers means we are especially likely to find plenty of reasons why we must preserve their right to stay – and die – on our streets. But you live and learn. Now at Thames Reach we take a more forthright approach in our work with long-term rough sleepers; the ‘entrenched’, in the jargon of the day. We are more conscious of the damage done to body and soul by rough sleeping and highly sceptical of the notion that sleeping rough should be interpreted as a form of rugged independence. So when we found Mary sleeping rough in Barnet, north London we initially, over many months, did everything we could to persuade her to voluntarily move from the street. But it was hopeless. Her belongings swelled around her, an irrepressibly rising tide of detritus as, over the weeks and months, kindly members of the public brought her food and clothing. Her mental and physical health deteriorated and each week she appeared to be getting weaker and weaker. With the winter looming we took the painful step, with the help of a supportive doctor who accompanied us onto the street to meet her on a number of occasions, of having Mary sectioned under the Mental Health Act and taken off the streets and into hospital against her will. Over the next few days a distressed Mary attempted to abscond and return to the street. But gradually she settled and recovered her health, later moving to a registered care home where, delightfully, she is now visited and supported by some of the same members of the public who were feeding her when she was sleeping rough. And then the most magnificent of final chapters was written when we were contacted by Mary’s daughter. She was separated from her mother as a baby and put up for adoption because, in the parlance of the day, she had been born out of wedlock. She had been tenaciously searching for her birth mother over many years. It doesn’t get much better in this work than a joyous family reunion and mother and daughter remain in close contact. It could have been very different. A few months after Mary was taken off the street we experienced one of the coldest winters for almost twenty years and in one grim week, two rough sleepers died in London. Mary would have been in extreme danger and instead of telling a daughter the happy tale of her mother’s recovery we could easily have been passing on the devastating news of her untimely and unfortunate death in below zero temperatures, the mother she was now never going to meet. And I can assure you, if that had been the case we would not for one moment have had the effrontery to have insensitively attempted to outline to the grieving child the doctrine of that execrable conscience-salver – the lifestyle choice.